I loved this book so much. Reading this as a gamer was just a dream come true. Here is my review for Warcross! For the millions who log in ever day, Warcross isn’t just a game – it’s a way of life. The obsession started ten years ago and it’s fan base now spans the globe, some eager to escape from reality and others hoping to make a profit. Struggling to make ends meet, teenage hacker Emika Chen works as a bounty hunter, tracking down players who bet on the game illegally. But the bounty hunting world is a competitive one, and survival has not been easy. Needing to make some quick cash, Emika takes a risk and hacks into the opening game of he international Warcross Championships – only to accidentally glitch herself into the action and become an overnight sensation. Convinced she’s going to be arrested, Emika is shocked when instead she gets a call from the game’s creator, the elusive young billionaire Hideo Tanaka, with an irresistible offer. He needs a spy on the inside of this year’s tournament in order to uncover a security problem . . . and he wants Emika for the job. With no time to lose, Emika’s whisked off to Tokyo and thrust into the world of game and fortune that she’s only dreamed of. But soon her investigation uncovers a sinister plot, with major consequences for the entire Warcross empire. when I first found out about this book, I knew that it had to be on my list of “OH MY GOD YES PLEASE THANK YOU” books. As a member of the gaming community, the concept of Warcross pulled at my heartstrings. An utter dream for any budding gamer, right? I mean come on, who WOULDN’T want to lose themselves and be placed in a virtual world? Plus the idea that you would be able to live within this world, make money etc. What a thrill that would be. From the beginning of Warcross, I was hooked. I fell in love with the world of Warcross (huehue, WoW puns.) I could imagine a game list Warcross becoming a reality. While wearing the Warcross glasses, you can not only dive into the heart of the game, but also use them in order to see names of people, buildings and more within the real world. How awesome would that actually be? Emika Chan, what a fantastic character. This female protagonist, a foster child, now expert hacker has nothing really going for her. She lives with the constant fear of not paying her rent, which makes bounty hunting such an important part of her life. With her hacking accidentally into the Championship game though, Emika’s world is turned upside down. From nothing, she’s flown to Tokyo by the one and only Hideo Tanaka, the creator of Warcross. She is then given the opportunity to hunt down a problem within Warcross. From within the championships, Emika must keep her job with Hideo secret from others while trying to figure things out. Her journey is one filled with romance, fast-paced action and thrills. Oh my goodness the Championships made my heart race. I could honestly imagine myself watching these from the comfort of my couch! Of course, Emika with her rainbow-colored hair and incredible talents for hacking are only the tip the iceberg when it comes to why I love her. She is just a bundle of joy and such a wonderful protagonist. The way she figures out things throughout the story and with each twist and turn, just.. GAH. I would also be doing Warcross a massive if I do not mention how much I LOVED how diverse it was. From race diversity in the form of Emika (Chinese/American) and Hideo (Japanese), gay relationships and even came in the form of one of the captains of a Warcross Championship team in the form of being in a wheelchair. I feel strongly that every single character that was present in Warcross could be relatable to readers, one way or another. Overall, I absolutely adored Warcross. It was everything that I expected when I first heard about it. Incredibly well-thoughts out characters, plot-buildings with many twists and turns and fantastic pacing. The world building was incredible and you could truly see yourself within it. Everything was just so vibrant and gorgeous and I want MORE! The second book of this series cannot come soon enough! 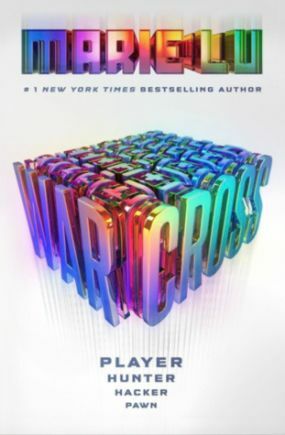 Warcross by Marie Lu gets an incredible 5 out of 5 flails! Next Next post: January 2018 Wrap-Up!